September 2, ISIS Wilayat Sana’a exercised a dual bombing at an al Houthi-run mosque in the Yemeni capital of Sana’a. One suicide bomber detonated a suicide vest in the al Muayid mosque and was followed by a vehicle-borne improvised explosive device that targeted emergency responders at the scene. 28 locals were killed and 75 were wounded. September 3, A vehicle-borne improvised explosive device killed at least five al Houthis in al Bayda city. No group has claimed the attack at this time, but Ansar al Sharia, the militant arm of al Qaeda in the Arabian Peninsula, has taken credit for at least six other attacks on al Houthi positions in al Bayda governorate between September 2 and September 4. September 4, At least 45 UAE and 10 Saudi soldiers were killed in an attack on a Gulf coalition military base in Ma’rib governorate. The soldiers died in an explosion when a rocket, launched by al Houthi forces, struck a weapons cache inside the camp. September 4, Two al Houthi army soldiers were killed and six others wounded when suspected al-Qaeda militants carried out an attack in the province of Shabwa. Over the past months, al-Qaeda militants have frequently carried out attacks on Yemen’s security forces. The militants have been also engaged in battle with the Shia Ansarullah fighters. 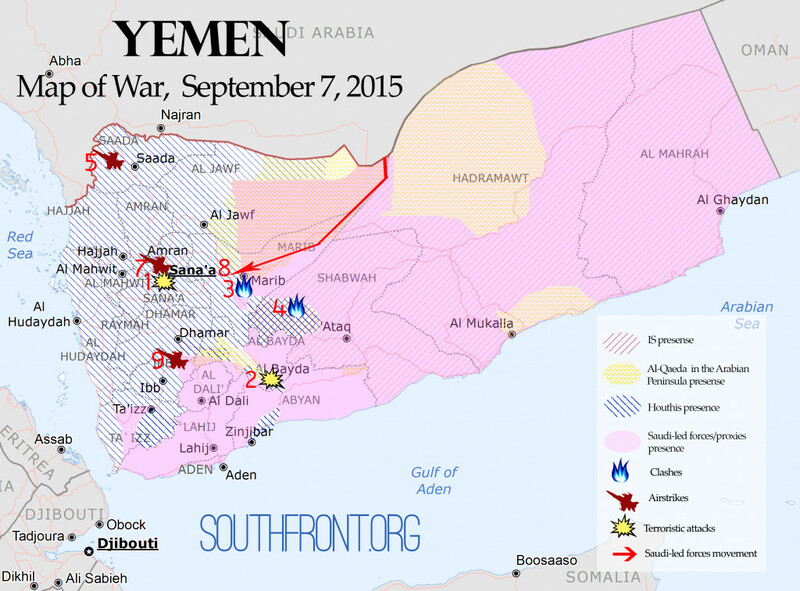 September 5, Saudi fighter jets launched raids on residential areas in the northwestern Yemeni province of Sa’ada. Several people including a mother and her child were killed. September 5, The spokesman for the Yemeni army Brigadier General Sharaf Luqman said that the Saudi cities of Jeddah, Abha, and the capital Riyadh will turn into legitimate targets for the Yemeni forces in their retaliatory attacks against the kingdom. September 6, Saudi-led coalition pounded the Yemeni capital with air strikes on Sunday. Coalition warplanes hit military bases on the capital’s Nahdain and Fajj Attan hills and the neighbouring presidential complex, south of Sanaa, as well as a special forces headquarters. At least 27 people were killed. September 7, Around 1000 Qatar Armed Forces soldiers, backed by 200 armoured vehicles and 30 Apache helicopters, head to Yemen’s Maareb province to join the Saudi-led coalition already fighting in the area. September 7, Saudi airstrikes killed 12 people and injured 39 others in the city of Yarim in Ibb Province. The US-backed coalition suffered high loses during the ground operation in Yemen. According to different reports, it lost from 50 to 130 troops last Friday. This number will apparently rise because of crucial stance of most injured fighters, their number is 200. Furthermore, the coalition lost 3 Apache helicopters and over 40 units of military equipment. The important thing is that 5 Bahrain fighters of the coalition were killed in the border territories of KSA. It covers the effectiveness of the Yemeni army’s realatory attacks. In any case, contemporary loses conducted a real shock in the coalition’s headquarters. Another important feature of the Friday’s incident is the fact the al Houthi fighters used a Tochka-U missile for the attack. In fact, al Houthis hardly have enough trained fighters to use the missile effectively. An example of this fact we could see in Ukraine where even availability of the missles didn’t help pro-Kiev forces to hit the targets in Donbass, sistematically. So, this case could be a solid argument to argue that there are Iranian military advisors among al Hotuhi forces. Considering the fact that the Saudi-led coalition failed the offensive on Taiz and jitters among coalition forces (Southern Resistance militants, Saudi Arabia, UAE have own goals in this intervention), we can easily predict that the future advance on the Yemeni capital through Ma’rib will be related for the coalition with heavy loses and won’t guaranty success.